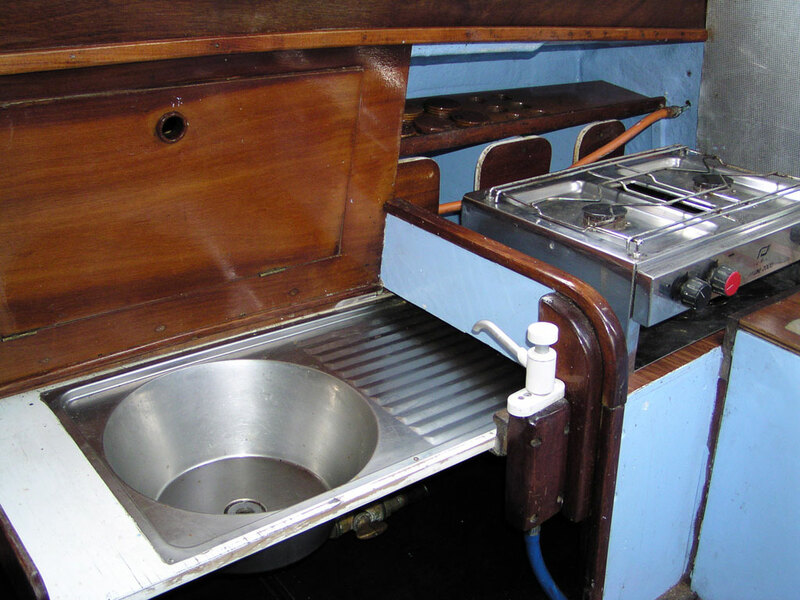 The sink was mounted to starboard. 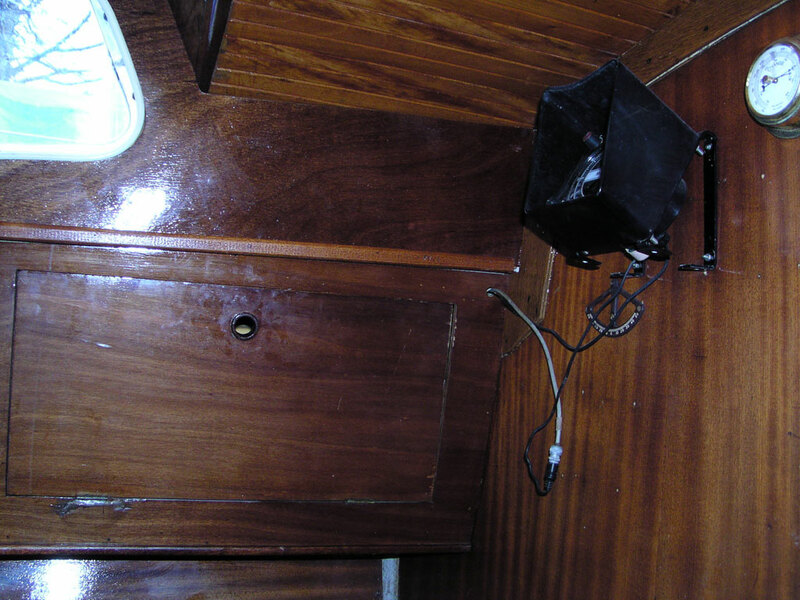 It slid out forwards from under the galley over the starboard bunk. 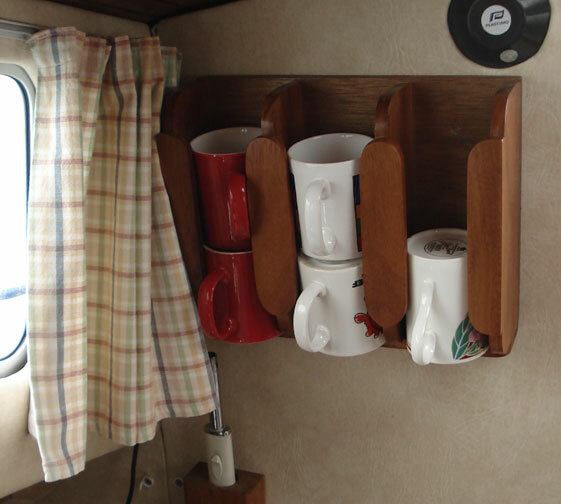 It was a clever space-saving idea. But it didn’t really work for us. 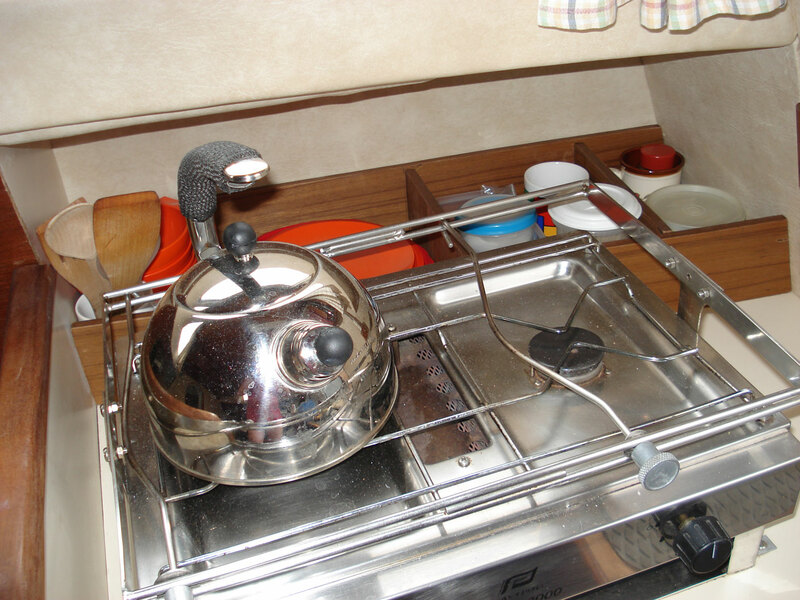 We didn’t want a sink over the settee. 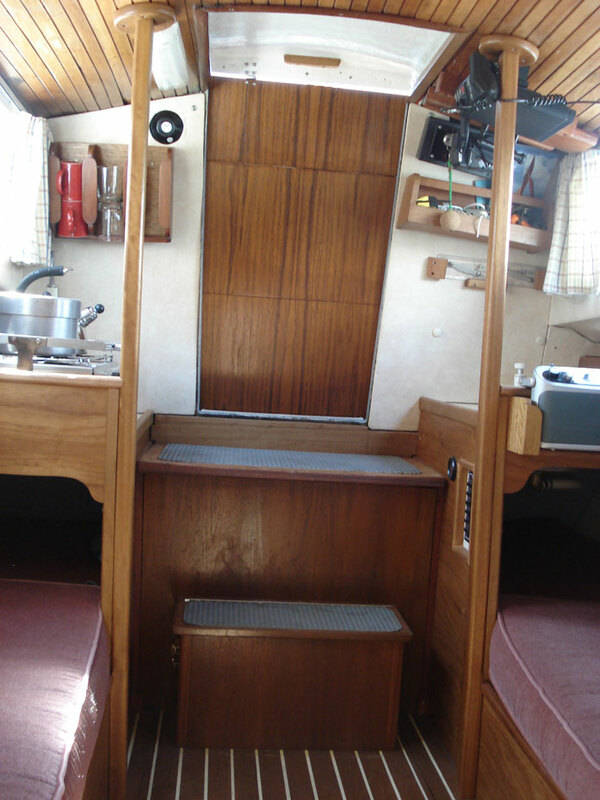 And when stowed away under the cooker, it left little leg room for a sleeper in the starboard bunk. 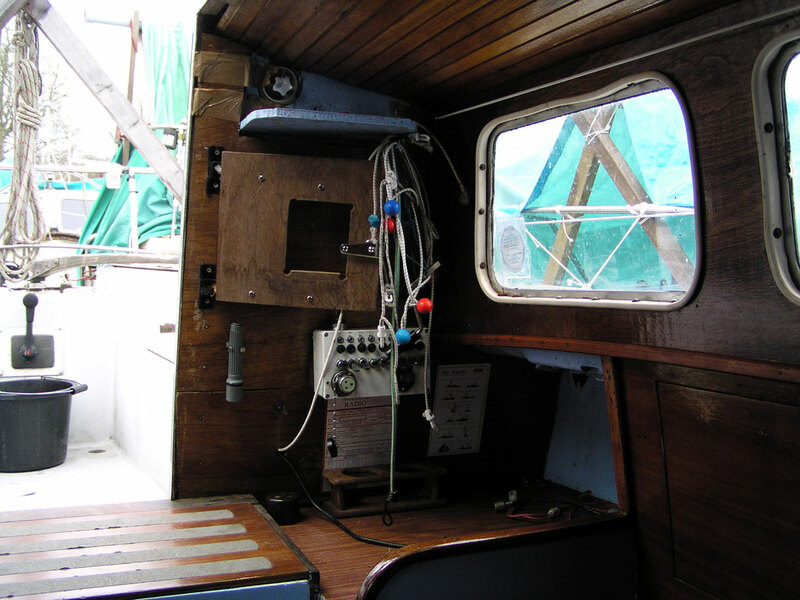 The chart table was shorter than standard and the size of the Bukh 10 meant it sat below the top of the engine box which stood higher than the sill of the companionway. Entering the cabin meant stepping up and over the engine. 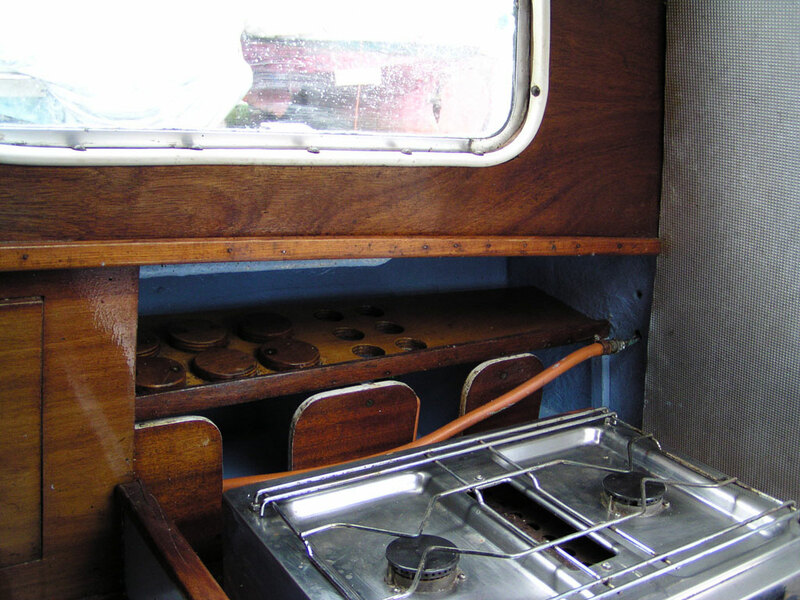 The Bukh was replaced by the smaller lighter Beta 14 allowing a more compact engine case which enables you to stand at the cooker and sink in the main hatchway (the only position below with standing headroom). 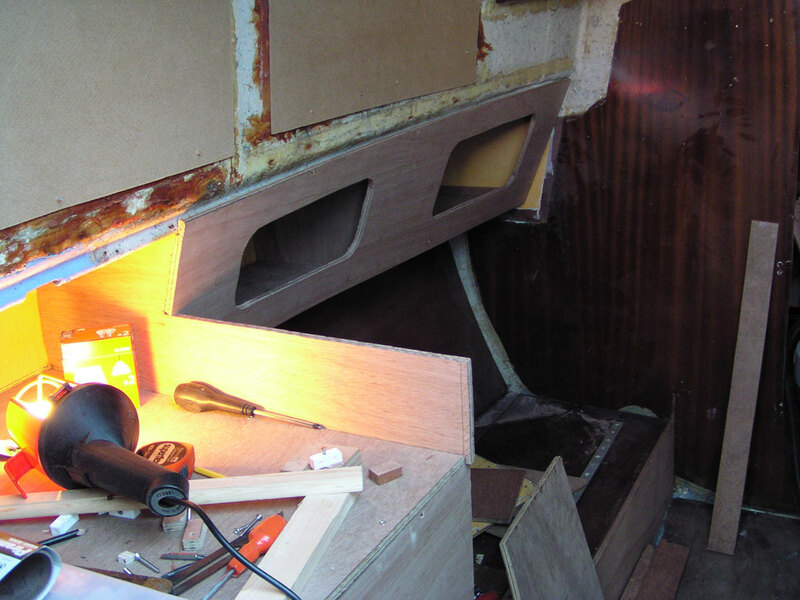 Initially the rebuild was carried out in cheap reddish coloured ‘Marine Ply’. 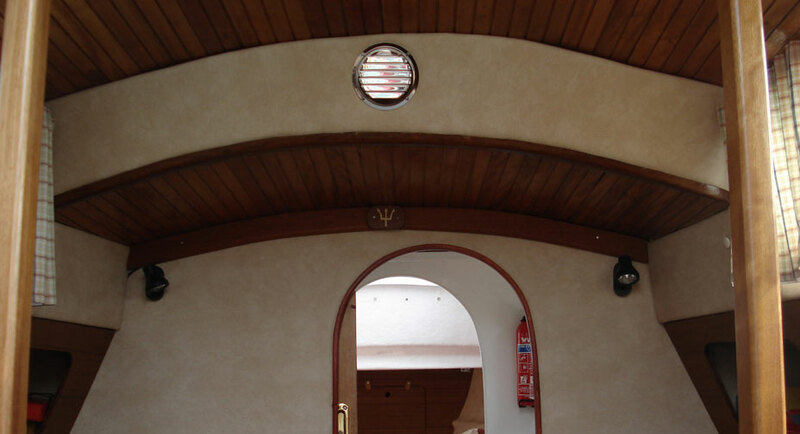 But later (after being inspired by Dave Quantrell’s superb teak interior for Pai Nai) this was either replaced with teak-faced ply or covered with 3mm teak-faced plywood. 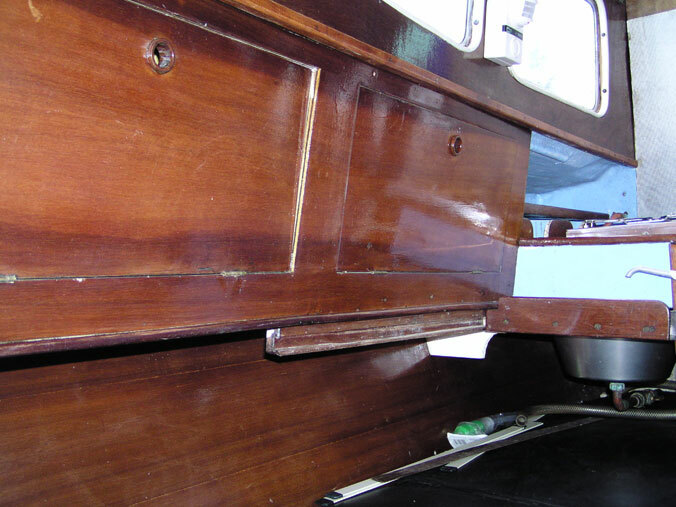 In effect, we rebuilt the saloon twice. 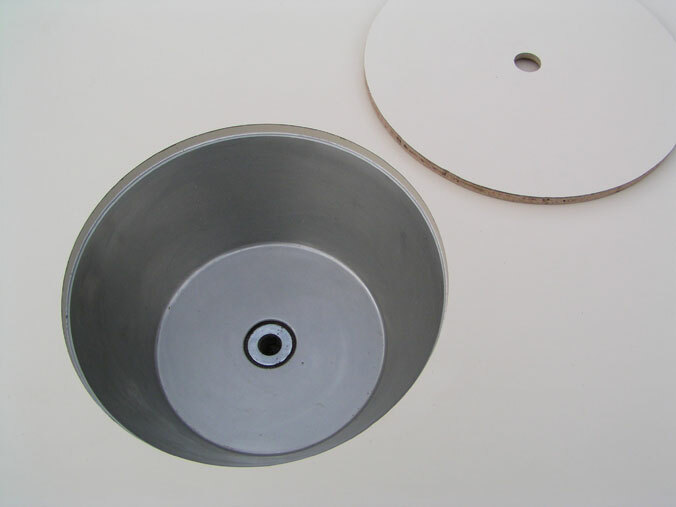 The result still isn’t a patch on Pai Nai which sets a high standard. But Lottie is a lot smarter than she was. 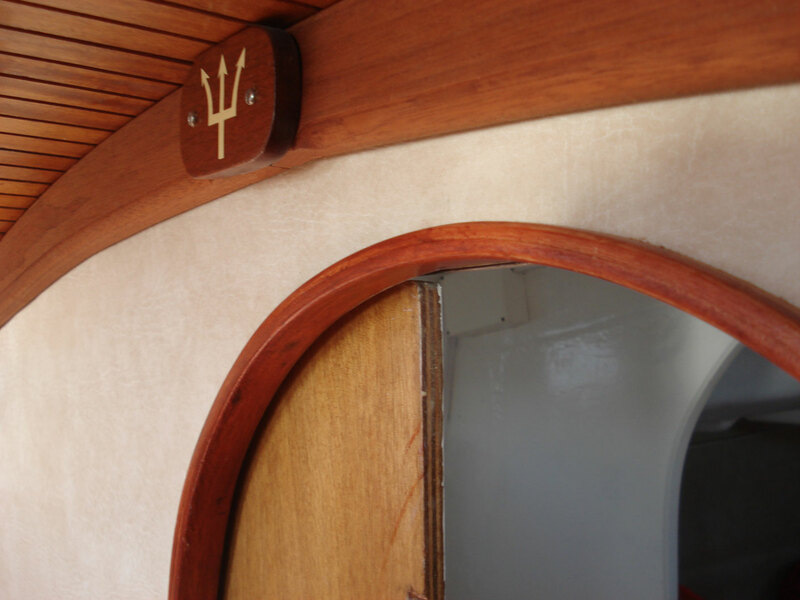 ( see Pai Nai here on the Trident Owners website). 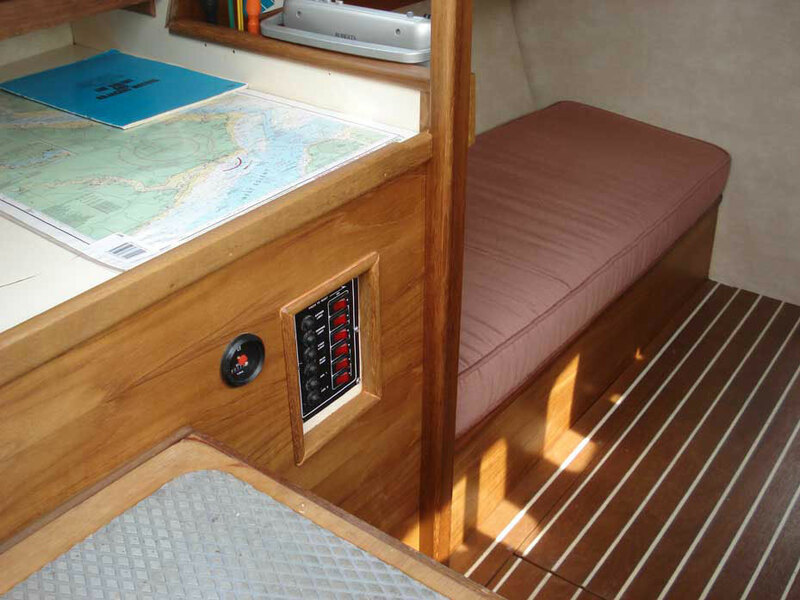 The grab posts either side of the companionway were inspired by those seen on Pai Nai and Chris Tabor’s Skerry of Arne. 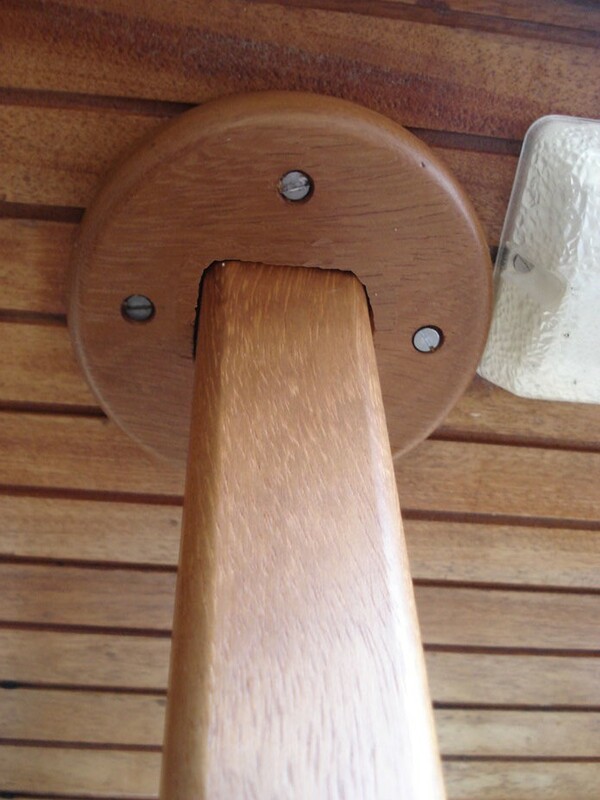 The solid wood used was iroko. 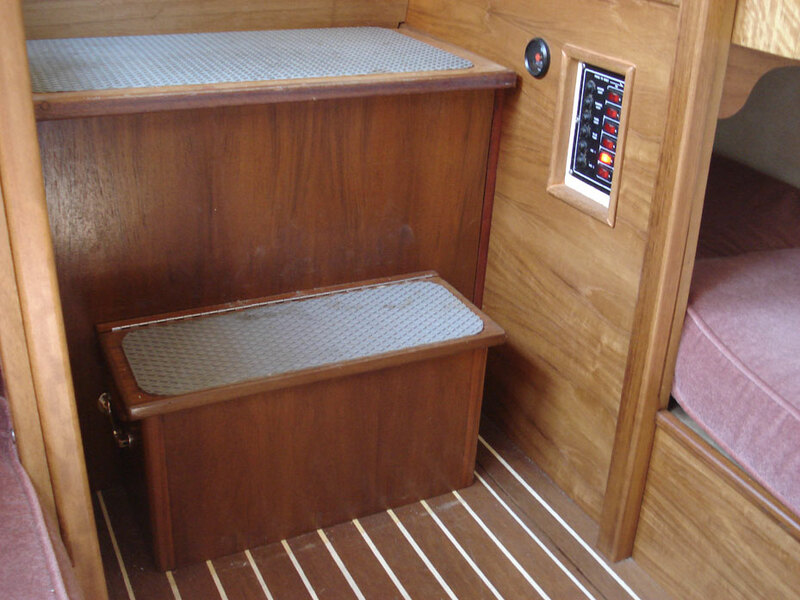 All internal wood was given several coats of Danish Wood Oil which gives a rich but low sheen finish. 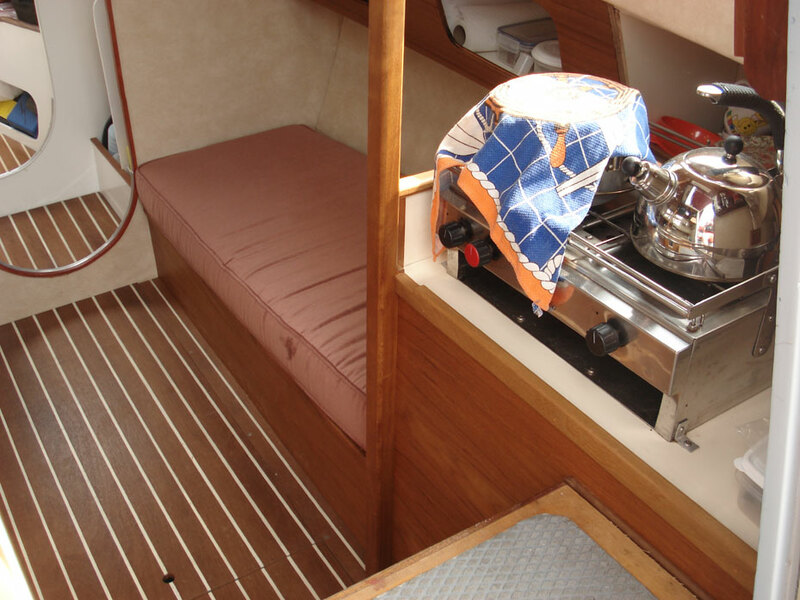 The faux inlaid floor (with painted stripes) saved me several hundred pounds since a Trident would require more than one 8×4 sheet of the real teak and holly inlaid stuff. 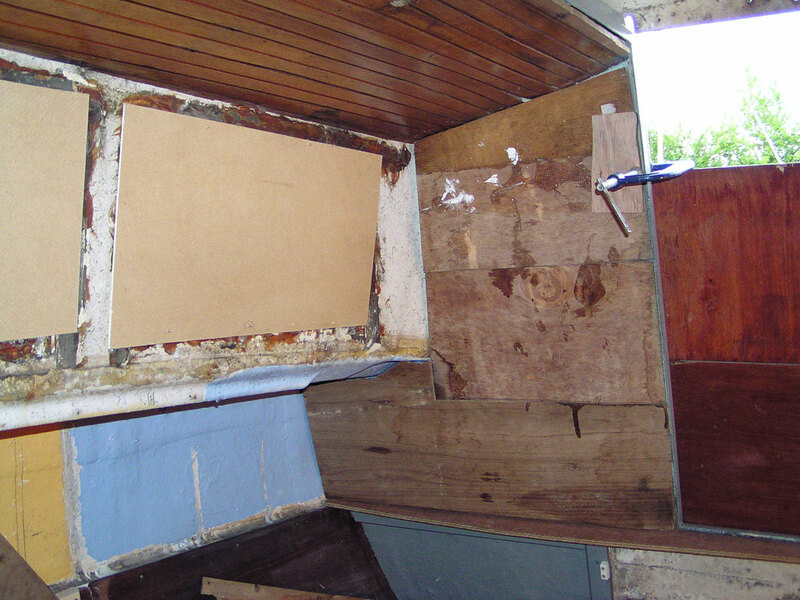 The main bulkhead was so damaged that it had to be covered up. 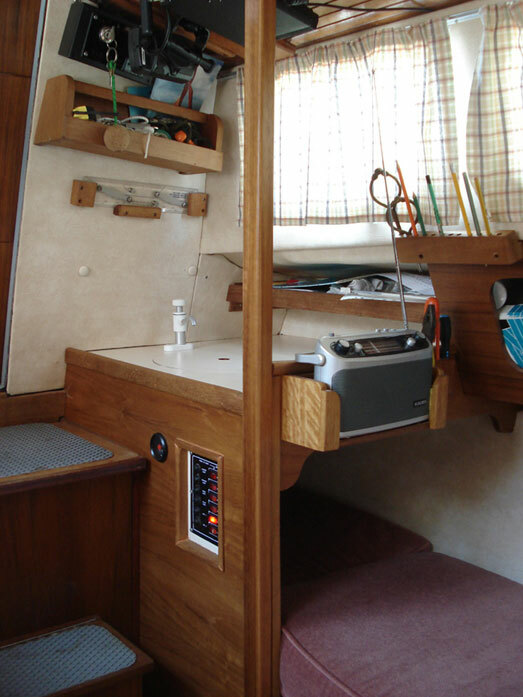 I contemplated teak veneer or a sheet of thin teak-faced ply but opted in the end for cream coloured Vinyl which lightens the cabin considerably. 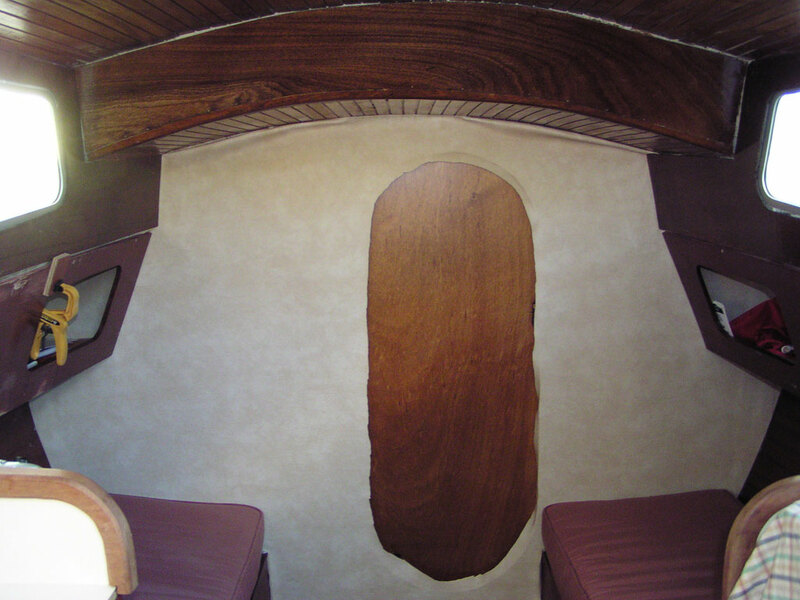 The ceiling is still covered with the orginal teak slats so the interior does not feel too plasticky. 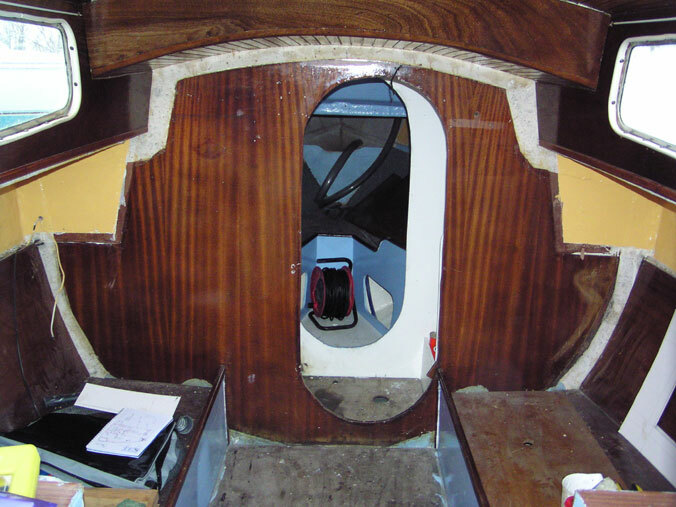 The vinyl edge cut round the doorway in the main bulkhead was trimmed with a laminated wooden moulding and a cover board fitted where the vinyl meets the roof slats. 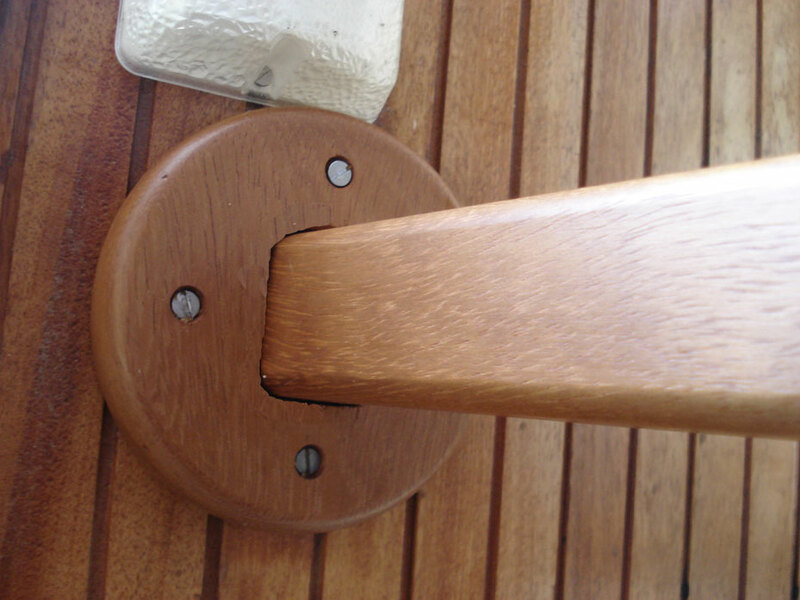 These slats are problematic however as they have been fitted crookedly and do not allow ready access to the deckhead inside to get at the fixings of any deck gear mounted on the roof or to attend to leaks. 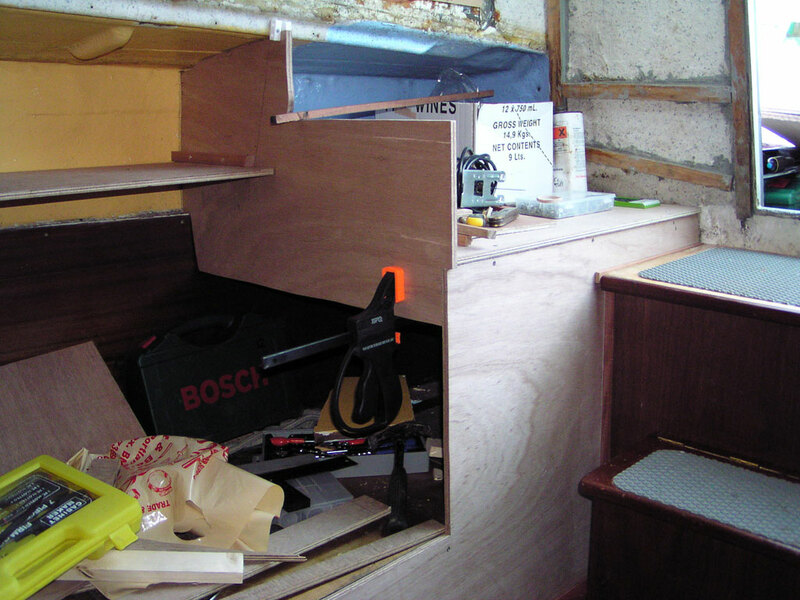 The inside of the ‘step’ of the doghouse, the cabin sides above deck level and the bulkhead each side of the main hatch have been lined with foam-backed vinyl stuck to 6mm ply boards. 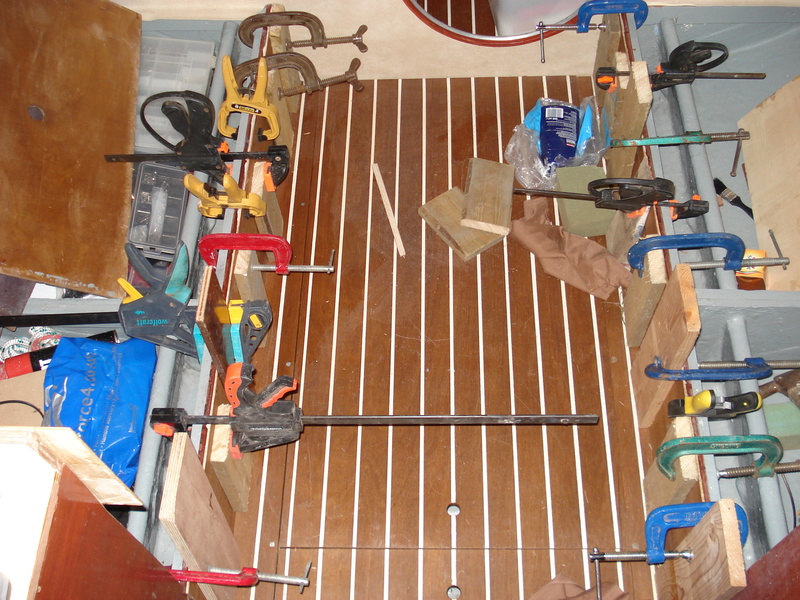 This is all subject to change if the roof slats are to be scrapped and replaced with removable ceiling boards. 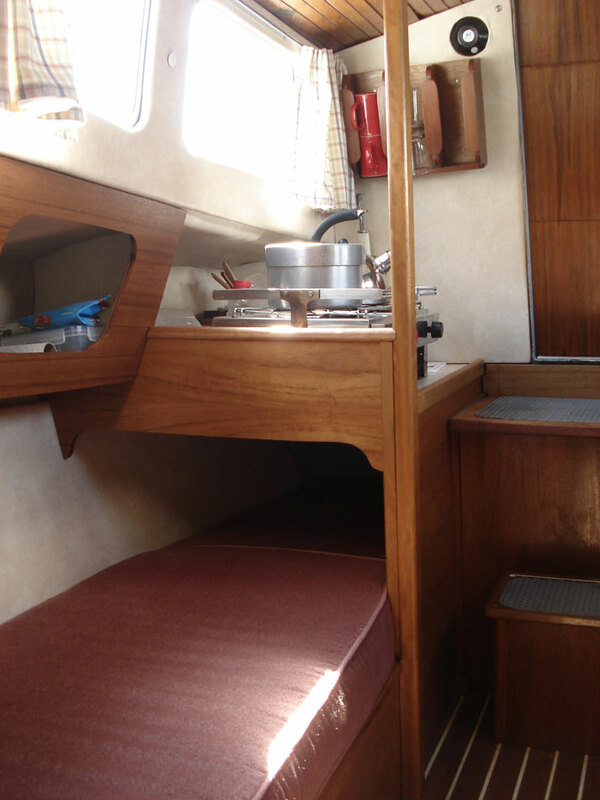 The plywood lining the hull behind the bunks was also covered in foam-backed vinyl to produce a lighter interior. 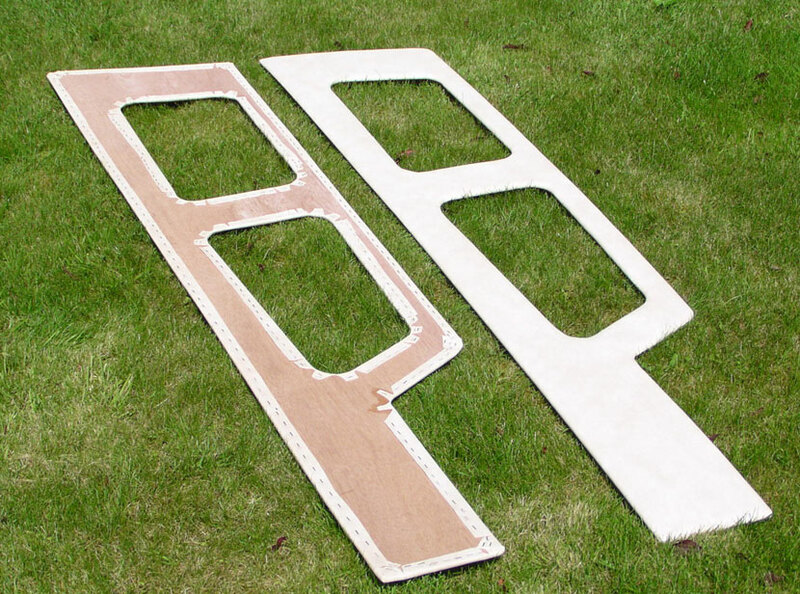 New bunk cushions were ordered from a small company specializing in refurbishing pub upholstery. 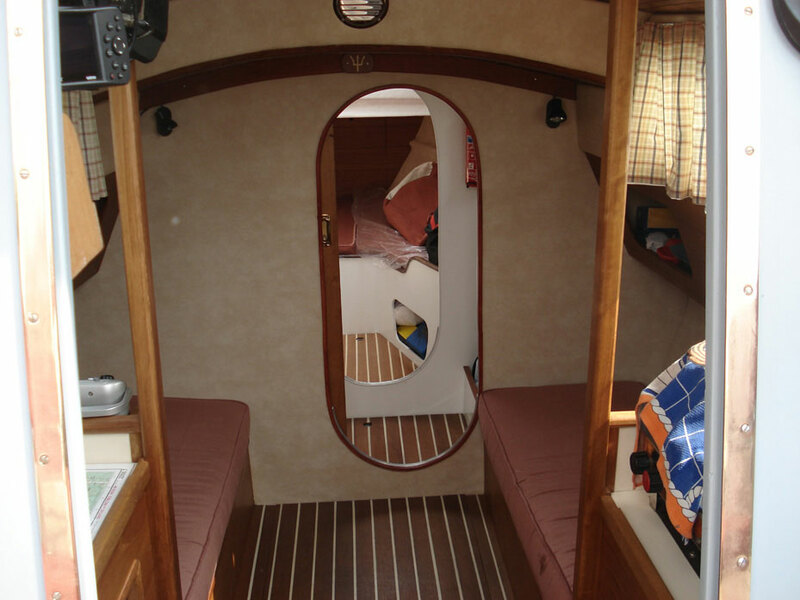 They charged less than half the price quoted by boat upholsterers and did a good job.